My husband and I were recently dining on a quaint restaurant patio on a beautiful night. Everything was great — the food was delicious and the conversation flowed — but something seemed a little…off. It took me a minute, and then I finally realized what it was. No music was playing. Once I discovered what was missing, suddenly every scrape of a fork and slurp of a noodle and snippet of banter from the nearby tables was magnified. It felt strange. It wasn’t long afterward that I had the same realization about my daily life. I don’t know how it happened, but somehow I just sort of forgot about music over the past few years. I turned it off and never turned it back on. It feels strange. Music was always an integral part of my life. As a student, I played instruments and sang in choirs and holed up in my room making mix tapes and memorizing lyrics. In my 20’s and early 30’s I was constantly learning about new artists and bands, going to concerts, listening to live music in a tucked away bar, or fiddling around on iTunes. Then something happened. I can’t blame it entirely on having kids, because even when they were babies, I remember buying and listening to new albums (notably, the John Mayer CD that I swore was the only thing that could get Brynn to sleep). Somewhere along the line, I just stopped making it a priority to listen to my music…the kind of music that can make me happy, inspired, thoughtful, calm, or energized. Instead, I found myself idly flipping from top 40 station to top 40 station in the car, or shoving my musical preferences aside for the sake of the girls’ Disney princess CDs. Sometimes, I’d just exist in a vaguely unpleasant silence. I’d walk from room to room in the house, folding laundry and completing chores, never noticing why things felt a little…off. The other day, as I was driving around in my usual haze of errands and kid-shuttling, I noticed that the music playing in the car was making me angry. (No offense, Houston, but your radio stations are terrible.) Listening to the same five pop songs for the 800th time each was doing nothing to enhance my mood, especially when I was already fuming at the jerks who refused to let me merge onto the I-10. As I thought about it, I concluded that there’s no good reason for me to torture myself with 65 Taylor Swift songs a day (even though I actually like Taylor). I might not have Sirius or a fancy audio system in my 2008 no-frills minivan, but I do have huge binders of old CDs at home collecting dust. I went home, dug out those old CDs and turned that van into a rockin’ time machine. It’s made SUCH a difference. Now while navigating crowded parking lots, traffic-congested highways, and busy city streets, I can sing along to Nelson and Ella Fitzgerald and Jewel, and re-experience a little of my music-infused past. I still occasionally want to punch people when I’m driving, but overall I want to punch people less. Baby steps. 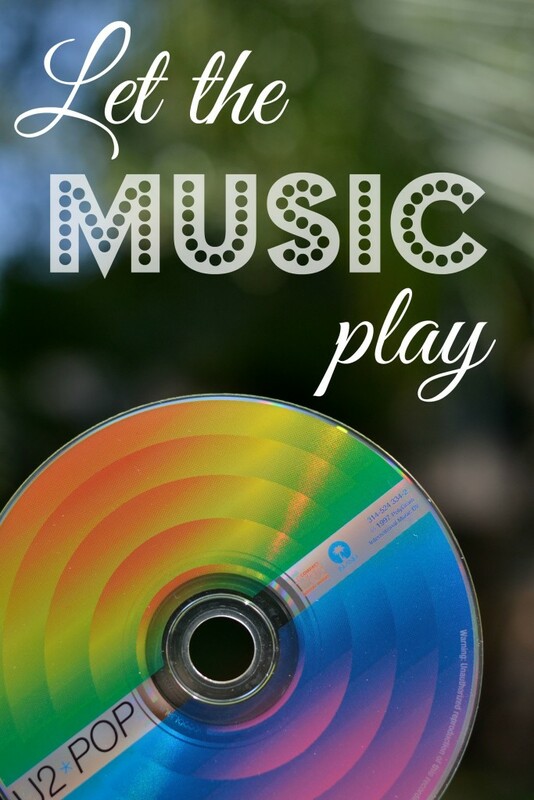 It’s not just about the car…I’ve made a conscious effort to surround myself with good music at home, too. And none of it has cost me a dime! If you’re not familiar with Pandora, it’s a free website and/or phone app (www.pandora.com) where you can customize your own personal radio station based on artists you like. I listen to Pandora when I’m working at the computer, and I love that it gives me a chance to discover new artists and music I like without having to do any research. I also started listening to music on the TV when I’m cleaning or cooking or doing things around the house (our cable provider uses Stingray, which offers a zillion types of channels from spa music to jazz to 90’s favorites). It instantly boosts my mood, and makes whatever mundane task I’m working on seem slightly more fun. 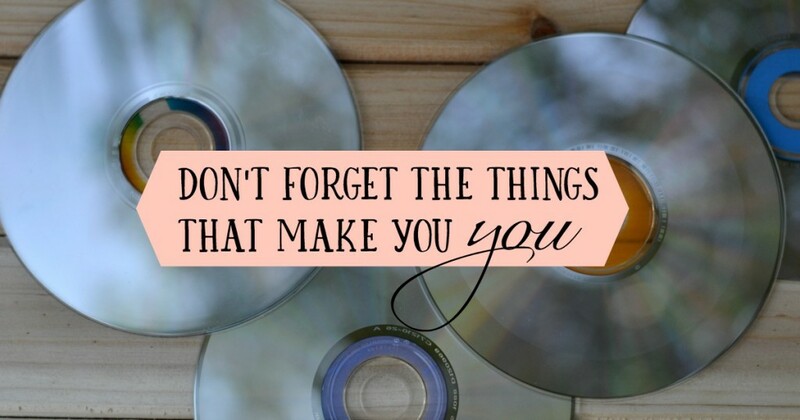 If you’ve forgotten about your music, too, or anything that makes you feel like you, make it a priority to get it back into your life in some way. And please share any tips you have for doing so! Loved seeing this post. Music was your life growing up, and such an outlet for your emotions. We remember the day after you left for college was the day the music died. We were soooooo sad. ?